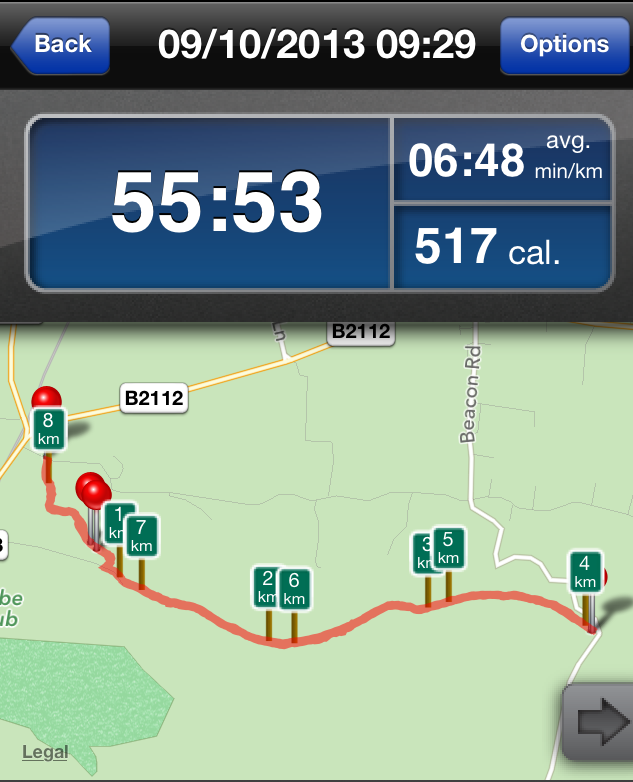 This is a run I know well, most notably from participating in the Dewpond 7 (Sunday 22nd July 2012). This was my first race and I set off too hard (the encouragement of the marshall’s ringing in my ears “You’re doing great, first lady through”) only to fade later and be overtaken – here’s a pic of me toiling through it – a truly horrible experience on a very hot day! Anyway, thankfully today’s run was nothing like that – it wasn’t exactly the same route either: the plan was to run from Clayton to Ditchling Beacon and back. 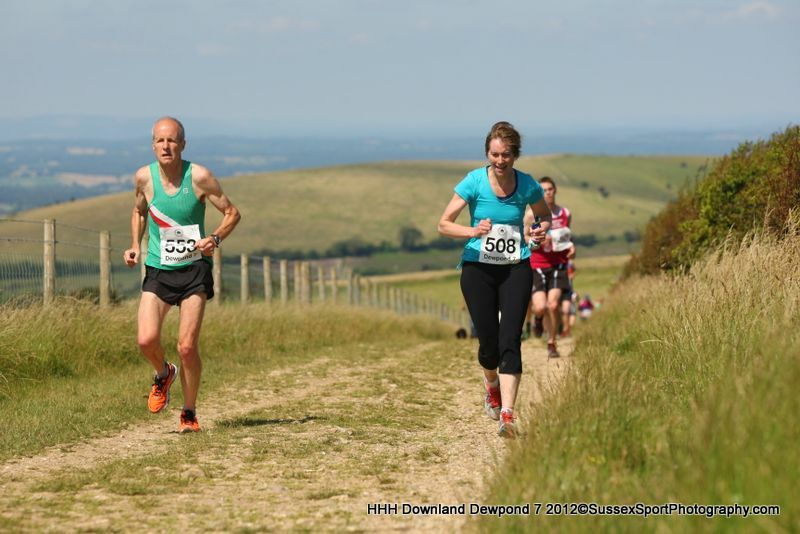 It starts with a punishing uphill from Clayton Rec – within seconds you are out of breath and fighting to keep going, but once up on the Downs it becomes a pleasant off-road route on well-worn tracks surrounded by beautiful scenery. Saw several walkers and dog walkers: always mindful to greet them with a big cheery ‘hello’ (those serial killers are never far from my mind) so they would remember me. Why do bullocks congregate near the gate? I am 47-years-old. I am scared of cattle. There, I’ve said it. Nervously entered the field with the bullocks and lightly jogged past them so as to not startle them. Always with my eye on an escape route, should I need it: a hedge or fence to dive over – maybe all that training for Warrior Run would pay off after all! 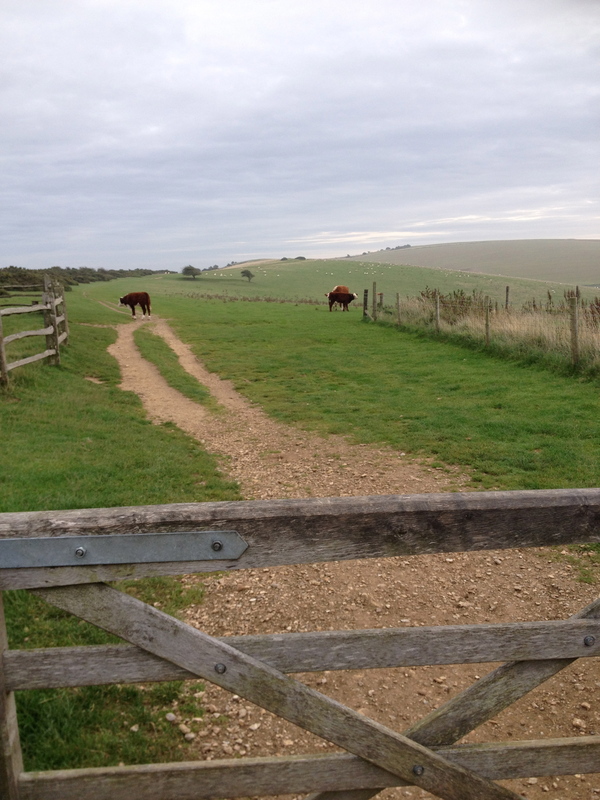 On reaching the car park at Ditchling Beacon I looked for the ice cream van (wasn’t there – why would it be?) did a circuit of the car park and headed back to Clayton – bit easier with a nice pelt downhill at the end! Was tempted to do a victory lap of the recreation field as I had at Dewpond 7 but felt slightly self-conscious with the dog walker looking on! 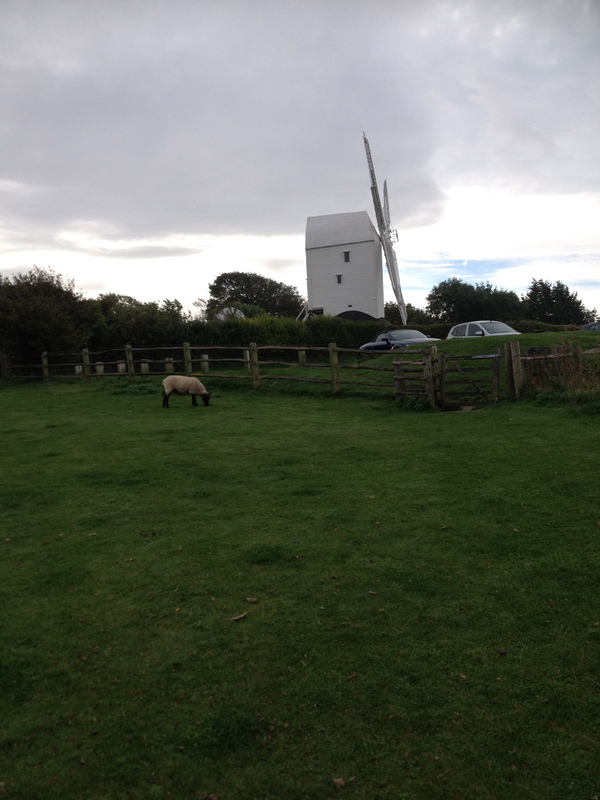 I had high expectations for Offham Farm Shop as their roadside advertising is very good; along the lines of: “You are passing an excellent farm shop” so it had been on my radar since week 1. Therefore, when I walked in (having allowed plenty of time) I was a little disappointed to see a cold counter, a fridge, and a table of produce – not much here to while away a couple of hours, I thought. I had time to peruse the baked goods on offer and study the menu as no-one seemed in a rush to serve me. A fairly ordinary selection of lunchtime fayre such as soup, sandwiches, pies and sausage rolls. The cakes looked more interesting (don’t they always! ): almond slices, homemade cookies, rocky road fridge cake etc. This felt more like a working farm with a small cafe and shop rather than some of the more ‘attraction’ led farms I had been to. The butcher was seen out back chopping up the meat while his wife (she says presumptuously) bustled around the cafe and made the pies and cakes. The speciality here being: good honest, plain food, largely consisting of meat and pastry. 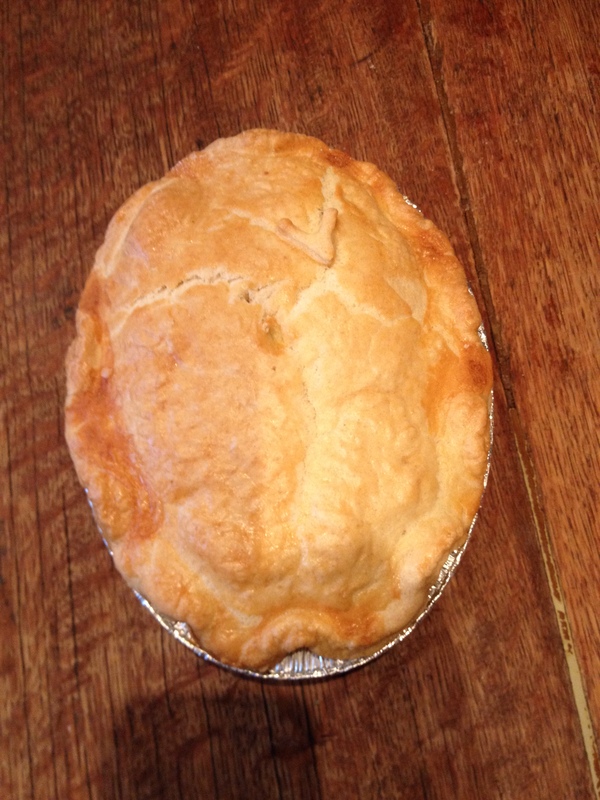 For my purchase this week I chose a beef and venison pie which was delicious and chock full of good quality meat. I was tempted by the pork and marmite sausages but they will have to wait for another occasion. As it was too early for lunch, I settled on an apricot and almond slice and a mug of coffee before finding a seat in the cafe where a man sat at a table, napping quietly, threatening to slide off his chair. I sat reading the newspaper for an hour enjoying the slow trade of truck-stop clientele and the grandmother with her grandson who chanted incessantly “I want a baby ‘cino with a marshmallow” – “you won’t get that here, son” I thought as she distracted him with a toasted muffin. Time passed and I decided to order the soup and crusty bread from the uninspiring menu. The soup was reasonable but the bread was clearly supermarket wholemeal sliced which was a disappointment, especially as they had some fine-looking crusty bread for sale in their shop. 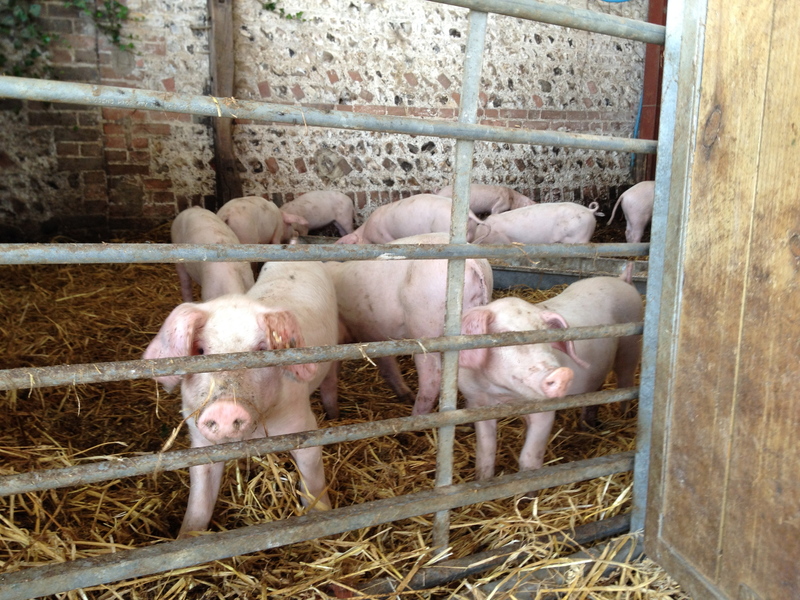 In the yard outside they had a few of their animals on show: pigs and piglets, sheep and chickens as well as three black-and-white sheepdogs who hunkered down and looked as though they would like to round you up as you passed by. Our erstwhile hitchhiker, Simon has suggested next week’s run, so that shall be our freebie of the day. I am signed up and enjoying your blog! 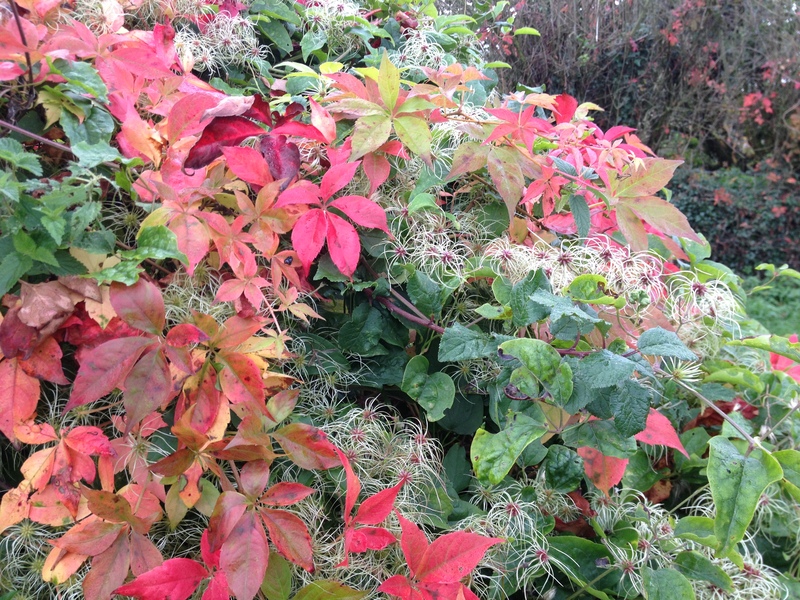 Looking forward to hearing how you will keep so cheerful through the dreary winter weather.